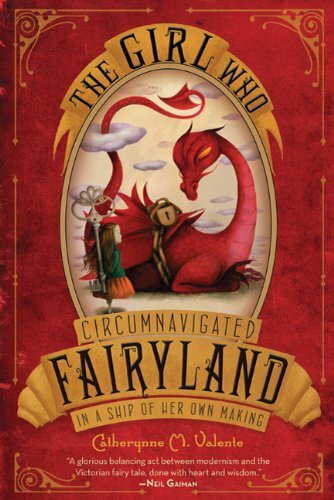 The Girl Who Circumnavigated Fairyland in a Ship of Her Own Making by Catherynne M. Valence. Feiwel and Friends, 2011. Currently available. Face Value: Simply enchanting. It presents as exactly what it is: a luscious fairy tale. The title forecasts the adventure that lies ahead, and the illustrated characters are intriguing and have a certain mysterious charm. The cover is what initially caught my attention, before I had heard anything about the book. My mother-in-law had a similar experience with the cover. She saw this book on my kitchen counter and was immediately drawn to it, asking all about the story and telling me that she wanted to borrow it as soon as I was done. This is a glorious example of illustration used to make an effective and intriguing book cover – none of that stock photo business needed, thank you very much. Does it break the slate? Yes. The book is peppered with subtle references to the girl characters of classic fantasy stories, particularly Lewis Caroll’s Alice and Dorothy from L. Frank Baum’s Oz stories. Although these girls are clearly September’s literary ancestors, September navigates her strange new fantastical world with a level of confidence and aplomb that Dorothy and Alice lacked. September is most definitely a fantasy heroine with guts. Who would we give it to? This is a tough call. The writing is very complex and the narration features a dry humor suited to young people reading at the YA level. However, our daring protagonist is a girl of 12, and would be an aspirational peer to readers at the middle grade level. I think this book would be good for a young reader who loves YA but wouldn’t mind reading about a character younger than him or her. Fantasy lovers both young and old will be able to really dig in to the amazing world that Valente has created. Review: I’ve never been to Omaha, Nebraska, but from what I have heard, I can surmise that it is not the most exciting town. It can be particularly tedious to be a resident of Omaha if you are a twelve-year-old girl who longs for adventure. September is just such a girl living in just such a town. When an unusual man in a very green outfit shows up and identifies himself as the Green Wind ready to whisk her away to Fairyland, September leaves home without a second thought. She craves a break from her boring life, and she is so excited about the opportunity to explore a different world that she doesn’t even remember to say goodbye to her mother. September’s mouth dropped open. Her eyes filled up with tears, and now, finally, they spilled over and dropped onto the muffin-stone square. Saturday put his hand on her arm but did not know what to do to comfort her beyond that. This may seem like a silly thing to cry over, but September had suffered so very much in such a very short time, and she was so certain that she had been circumspect with regards to food. She had been careful! Even if the Marquess was frightening and Saturday so dear and broken and Ell so devoted – at least, she had thought, she had not eaten Fairy food! At least, she had managed better than most little girls in stories who are repeatedly told not to eat the food but do it anyway, being extravagantly silly and stupid! Of course, although she has made a mistake, September is not silly or stupid. She’s a smart and bright heroine who pays attention, which is more than we can say of Alice. The language of this story is lush with description and feels very old-fashioned, but in the best kind of way. It is poetic in a way that reminds me of Lucy Maude Montgomery’s wonderful writing. It is such a joy to read books that have a “classic” feel. The fairy tale is often twisted and turned and subverted, but it is not often that we get to read an original, contemporary fairy tale that still has the style and finesse of Baum, Carroll, or Andersen. Valente has given us just such a book, and it is to be savored. September would have been happy to watch her mother shoulder-deep in engine grease, but her mother wasn’t like that. She made September learn very well how a clutch worked, what to tighten, what to bend, and in the end, September had been so tired, but the car hummed and coughed just like a car ought to. That was what September liked best, not that her mother was not about and she had the freedom to think about her from time to time – to learn things, and her mother knew a great number of them. She never said anything was too hard or too dirty and had never once told September that she would understand when she was older. Ah, what lovely things to hear about a mother character. Obviously her parenting tactics are working because September manages to figure quite a few things out on her own while in Fairyland and works her way out of many tight situations. I admired this mother-daughter relationship and how the author worked in the “absent mother” motif from the fairy tale genre without making it damaging for September. Although her mother was not in Fairyland, September often drew on the knowledge imparted by her mother in order to survive. No one is chosen. Not ever. Not in the real world. You chose to climb out of your window and ride on a Leopard. You chose to get a witch’s Spoon back and to make friends with a Wyvern…You are not the chosen one, September. Fairyland did not choose you – you chose yourself. You could have had a lovely holiday in Fairyland and never met the Marquess, never worried yourself with local politics, had a romp with a few brownies and gone home with enough memories to fill a lifetime’s worth of novels. But you didn’t. You chose. You chose it all. My heart stopped for the briefest moment while reading this passage. It is utterly and breathtakingly Slatebreaking to read a character adamantly asserting that a girl has a choice in the way her story turns out. This is what makes September so different from the other fairy tale heroines that are part of our cannon: she has control over her own story. If that’s not worth sharing with young readers, then I don’t know what is. Reviewed from a copy purchased at Book World in Portage, WI, which is now closed. It’s a sad day when a small town loses a bookstore. This entry was posted in Reviews, Young Adult and tagged alice in wonderland, fairy tale, journey, wizard of oz. Bookmark the permalink.